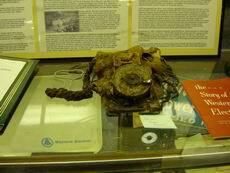 The second floor of the Museum of Communications houses old telephones of all sorts. The following is a picture gallery of the second floor. 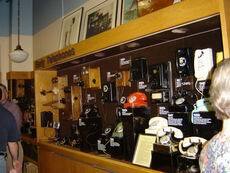 More old telephones, including the multi-colored Western Electric 302 sets. 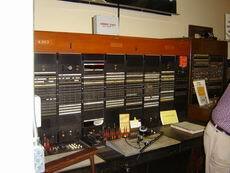 An old cord board from Seattle. Notice the rate card on the bottom. 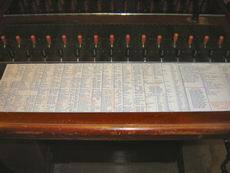 It lists long distance rates to all ratecenters in Washington State and to large cities in adjacent states. 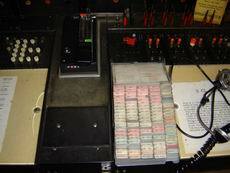 A cord board terminal, with flip-style rate charts off to the left, and multi-frequency keys to access the long-haul network. An "Introducing TSPS� (Traffic Station Position System) manual, instructing operators how to interface with the (then) new cordless operator system. 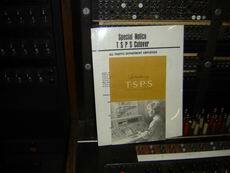 TSPS was a revolutionary invention because all operator functions (such as call handling and billing) were computerized. A TSPS cutover notice for Seattle area operators. 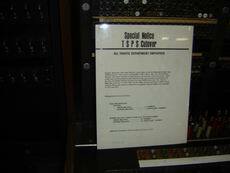 The sign says that TSPS was to be phased in over the course of 1971 and 1972 in the Seattle region. Again from �You�ll never know what you�ll find� department. 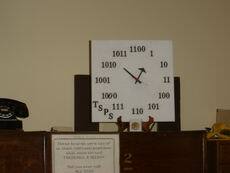 A clock that pays homage to TSPS, showing time in binary code. 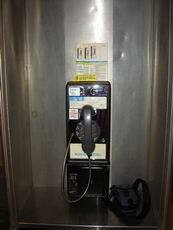 Yet another three-slot pay phone, this time with separate mouthpiece and earpieces. 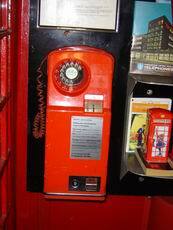 A British telephone booth, with a British payphone of the period. 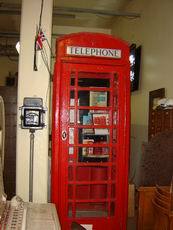 Supposedly getting this phone booth over to the museum was very difficult (flown in from England) and took some very dedicated people to get it there. 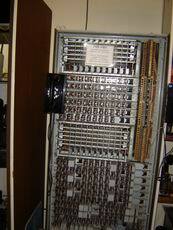 A Western Electric 755 PBX. 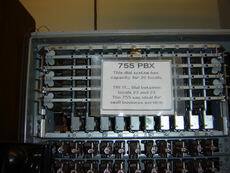 You can make calls from one phone to another via the PBX. I think this phone is beyond repair, and the trouble ticket shows this to be the case. It is assumed that this phone melted in a fire. 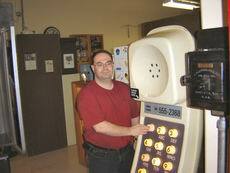 Here is a Trimline phone that's on steroids! This phone was made for the 1962 World�s Fair that was held in Seattle. The phone actually does work, and was connected to the #5XB. 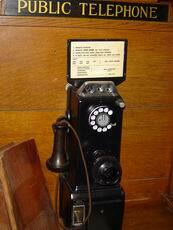 Step on the pedal next to the phone, the phone lights up and you hear a very loud dial tone. 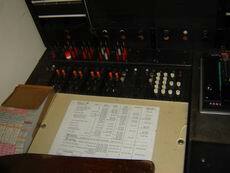 Pushing the buttons creates loud DTMF tones and calls can be completed, if you really are inclined to do so. 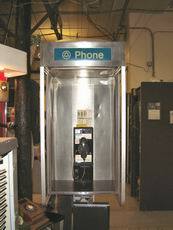 Here�s a modern style phone booth, with a rotary-style Western Electric fortress pay phone. The phone does work and is connected to the #5XB.